I am a curious eater. This is why I’m stepping out and giving you two recipes for grain free chocolate chip cookies, but let me tell you how this happened. It’s not that I’m 100% against grains. I’m not. But, I think there’s a lot to be said for avoiding them 80% of the time. I’m not about to call any food bad that I make here at Spinach Tiger. I do bake and cook with flour, rice, quinoa, etc. I want to make that very clear. However, I’m one of those people that just does better sticking to a diet most days that is heavy vegetables, heavy protein. I do notice that when I go about four or five days eating like this, I start to crave sweets. I especially crave chocolate. I need to have some choices for those days. These are the cookies that I can turn to for that much needed sweet, chocolaty treat on the days I’m not eating pasta. I found them both at Baking and Boys, the blog assigned to me for the Secret Recipe Club. Katrina had a lot of recipes for chocolate chip cookies. More than I think I’ve seen on any other blog. But what took my interest most was that she had two grain free recipes for chocolate chip cookies. She loves to bake, but is turning more and more to baking grain free recipes which fits my life style. She has a recipe for a grain free chocolate bundt cake that I may go back and try, because I love chocolate cake and it looked as good as any regular cake. The first was the real deal chocolate chip cookie from Against All Grain with no unrefined sugar. The second cookie was a chewy grain free chocolate chip cookie with no unrefined sugar and mainly made with almond butter from Unrefined Kitchen I wanted to write and ask Katrina which one was the best, but we’re not supposed to give away who we have until reveal day. So, I decided to do a grain free chocolate chip bake off. It’s super bowl day, why not have a grain free chocolate chip cookie bowl, right? The first grain free chocolate chip cookie (A) is from Danielle at Against All Grain, author of a book by the same title. The second cookie (B) comes from the Unrefined Kitchen and the recipe is there. The joy of being assigned someone’s blog is learning what inspires them and find out about other blogs to read. I’ll be visiting both of those blogs frequently. Here’s the funniest thing. Since I published this post last night, Katrina and I discovered we both had each other’s assigned blogs and we both chose to make two recipes. She made my best chocolate fudge cake and split pea soup. Is that more than a coincidence? Don’t you love when things line up like that? Grain Free Chocolate Chip Cookie A (the red) is made with almond flour, coconut flour, coconut palm sugar, grass fed butter, egg, baking soda, vanilla, chocolate chips and my addition of pumpkin seeds, but you could use any nuts. Grain Free Chocolate Chip Cookie B (the blue) is made with no flours whatsoever, only almond butter and I thought I read it wrong and was doubtful that it would bake like a cookie. There is baking powder, baking soda, egg, vanilla, and your choice of coconut or nuts. I chose nuts. It baked beautifully, and as it cooled, it was so good, I doubt you would know it was a grain free cookie. Really good. .
We loved both cookies. 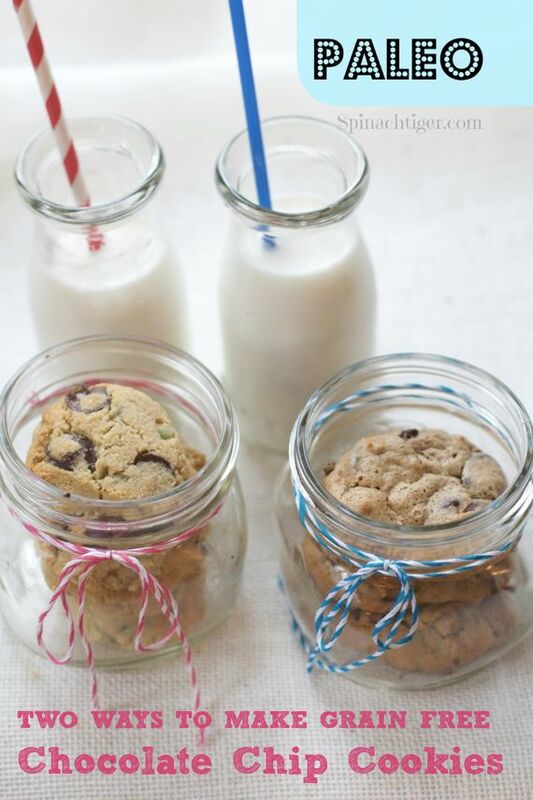 At first I was partial to chocolate chip cookie A (in the red) made with the almond flour. But, as the day went on, I started to lean towards the chocolate chip cookie B (in the blue). Both are completely different. Both surprised us. I put them in jars and put the lid on so we would stop eating them. Now I know where to turn when I want a grain free chocolate chip cookies. 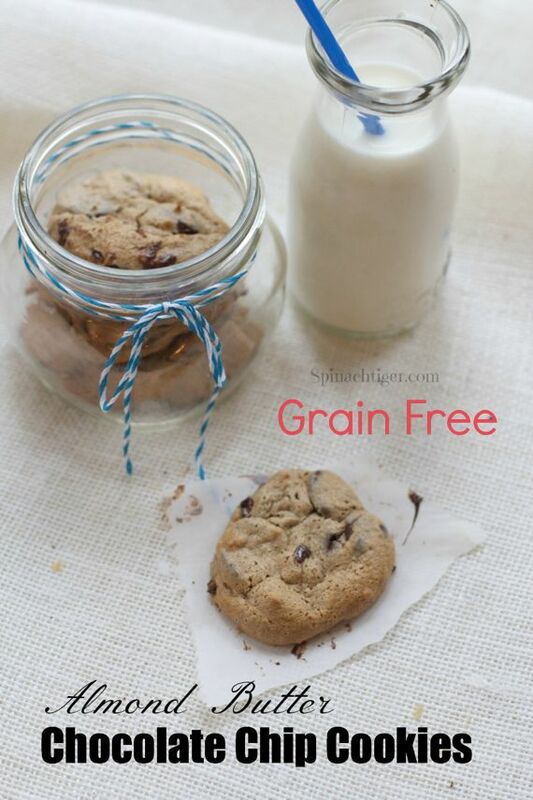 Adapted from Against All Grain (blog and book) real deal chocolate chip cookie that is grain free, gluten free. In as separate bowl, mix almond flour, coconut flour, baking soda, salt and mix until well combines. Add in chocolate and pumpkin seeds. Drop cookies by tablespoon onto parchment paper. Flatten cookies as they will not spread out. Just made the “Unrefined Kitchen” cookies. delicious. I think next time I will use 1 cup of mini chocolate chips, rather than the mega chunk, both Enjoy Life brand & omit the walnuts. My boys said they would like them better that way. ha. I too am a curious eater so I love experimenting, especially in my baking. Love both these cookies! Gotta give them a try. They sound fabulous! what a fun SRC post! love that you and katrina had each other too. both cookies look great! I like eating grain free too, Angela, but I am not in the right ‘zone’ to do it just at the moment. Love your recipes, though! And gorgeous photos! Lizzy I do it at least five days a week. Otherwise I would be as big as my house. LOL. The all or nothing approach works well for me. I even have to be careful with these cookies. I’m definitely trying these! They look so great – I can’t believe they’re grain free. Thanks, I know. My first grain free baked goods. Exciting. I LOVED your comparison and they way you delineated both types with the red and blue – even down to the straws! Very creative and these are both recipes I would try, so I appreciate the insight as to the difference and your preference. Thanks! I’m always trying to find way to sneak something semi-nutritious past my kids. Interesting! Do you think you could use peanut butter instead of almond butter in the second? That’s a good question. Healthwise, I think almond is healthier and is a different texture than peanuts which are legumes. Peanut butter is cheaper, but I have no idea. I’m going to experiment with something in microwave today. I’ll let you know. Lovely cookies! Healthy and surely very addictive. Love it! I’ll have to give both recipes a try, too. I’m not grain free either, but those are completely intriguing. Thanks for sharing with the SRC. Camilla, Sometimes it’s fun to experiment. You would like them. 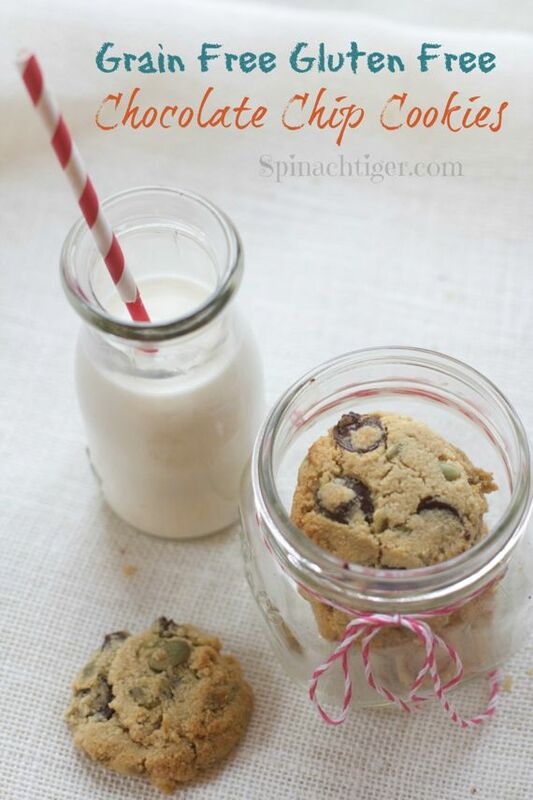 I love that you tried both versions of these cookies – they both look amazing! Great photos Angela!! Thanks Jane. I can’t believe i did both myself. It was fun. 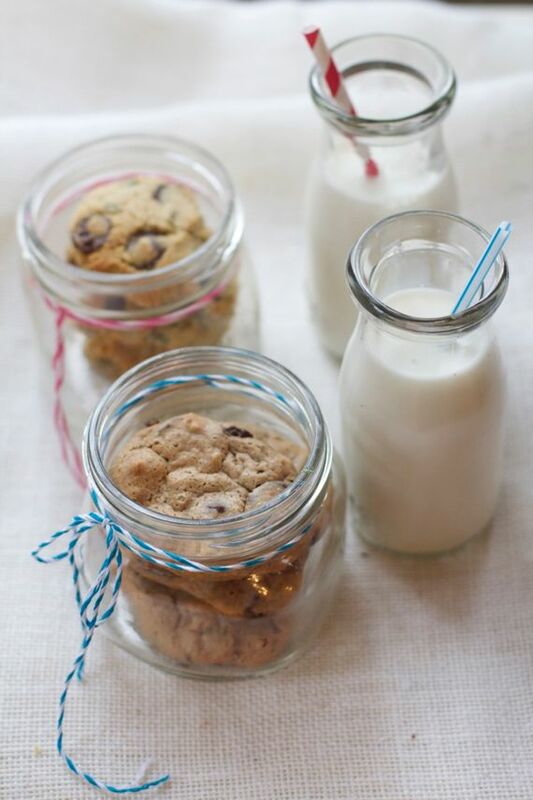 What a brilliant idea – a cookie bake off! I also love those gorgeous little bottles you used – just beautiful. Thanks, the bottles were a Christmas present. My friends know what I like. That is so funny that we both had each others’ blogs and both made two things! Yes, I love chocolate chip cookies. 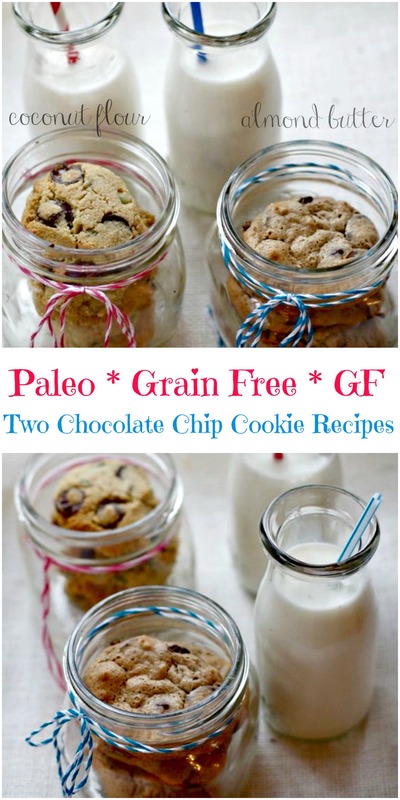 I have been so happy to find both those grain free recipes. Not sure which I’d pick as the winner either. I think I love the chewiness of the Unrefined Kitchen ones better. Dang, I’m going to have to make them both again to really decide. 😉 Yeah, tough to be a baking blogger and have gone gluten free, refined sugar free since last June. But I’m loving discovering so many new, yummy things. Can’t wait to try your chocolate cake as a cake next time. That frosting is divine. Love soup and split pea might be my favorite. Loved stalking your blog over the last month! Thanks for enjoying mine. I so get you. I do allow myself small sugar treats, but I just like baking and sharing more. I’ll be coming back to your site for more unrefined sugar treats, especially grain free. I am a all-carb-little-meat kind of person, but you make me want to go gluten free! Those cookies do look delicious! Yum, both of your cookies look like they turned out great. It would be awesome to eat chocolate chip cookies and actually be able to say that I’m eating something that’s good for me too. Yes, they actually hit the sweet spot and yet I didn’t have to eat 12 of them.